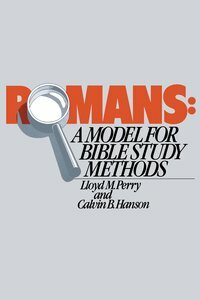 Romans: A Model for Bible Study Methods is a unique resource. It is both a commentary and study guide, full of suggestions and guidelines for individual or group study. It includes general study methods for Romans, approaches for outlining the letter, special study projects, and even a comprehensive final exam. This resource is recommended for both pastors and lay leaders-anyone who wants a thorough grasp of the book of Romans. About "Romans: A Model For Bible Study Methods"